A New Adventure . . . and Some Exciting News! I’m heading off on a new wilderness adventure soon. More about that later because I’m excited to tell you first that while I’m away my blog will be having its own adventure too. Since I’m heading to a region that is unlikely to have any wi-fi, I may miss my big moment. Redbook magazine contacted me recently and they’ve asked to feature one of my recipes in one of their August issues! Which one do you think it is? C’mon. Vote. Just for fun. Poll Closed. UPDATE: the recipe that was requested was Shot Glass Lemon Meringue. In a sense, writing this blog has been a wilderness adventure. I started it simply to digitize the recipes I had scrawled on little pieces of paper or clipped from magazines and stuffed into my kitchen cupboard. I had to learn the ins and outs of WordPress and editing photos and along the way I’ve made a multitude of connections all around the world, amazingly just through writing about what I’m making for dinner. People from every country from A-Z have visited my little blog–from Andorra, Armenia, Bahrain, Croatia to Zambia and Zimbabwe. It never ceases to amaze me to learn that I’ve connected with so many others right here in my kitchen. BEARS? Further reading warns me to beware of bears, especially during berry season. This is berry season, people. And now they tell me, once I’ve already committed to this trip, that this is Grizzly territory too. While searching for my hiking whistle, they tell me that they actually call that a “dinner bell”. Hmmm. and a whole lot more, including some new recipes that I’ll post when I return. So armed with my new self-inflating Mustang life jacket and still searching for my whistle to scare those bears away, I’m ready to go. This entry was posted in boating or camping food, seafood and tagged broughton archipelago, find life experiences and swallow them whole, food for sailing, recipes for camping and boating, Redbook magazine. Bookmark the permalink. 5 Responses to A New Adventure . . . and Some Exciting News! You are going to have a marvellous time – I know you will post pictures upon your return – cannot wait to see them. 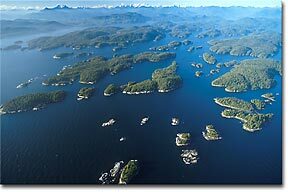 Just cruised through some of these islands Elaine..we were spell bound by the beauty of our coastal region. You are so going to love it and your wonderful food will be such perfect pairings to the scenery ! Have fun! Hope the sunny weather returns soon…it was actually hot in Alaska! So glad you reposted this on my blog – I remember your shot glass lemon meringue recipe – as I recall I saved it to come back to later, but I never did, so thanks for the reminder – I am definitely going to give it a try soon. Happy new year to you! And to you, Marie! I’m looking forward to another year of your Motivation Mondays!